The cast-iron fronted building at 436-440 Lafayette St. (Edward H. Kendall, 1870-71) carries a brass clock over the doorway inscribed Mann Refrigeration. 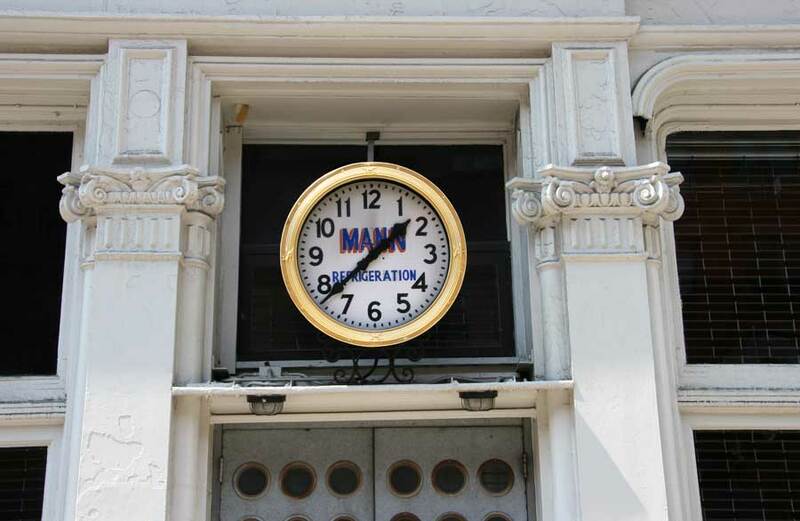 The clock is hardly original with the building, however, and must have been put up between 1952 and 1972 when the Mann Refrigeration Co. was located here. Mann Refrigeration were dealers in refrigerators and other refrigeration equipment, and their proprietor was Moe Mann (1899-1986). Moe Mann, refrigerators, began in 1941 on Union Square, moved for a few years to 6th Ave., and then to 15 Astor Place where they stayed from 1945 to 1952. The company seems to have provided service as well as supplies for refrigerators. And they were also known as the Mann Trading Co.
Moe Mann, the person, was born in Poland. His birthdate is given as 11 April 1899 on his Social Security Death Index record. He died 18 May 1986 in Miami, Florida, and a record in the Florida Death Index gives a different birthdate: 11 March 1900. Two passenger lists seem to confirm the 1899 date. He gave his age as 51 in Nov. 1949 and as 53 in August 1951.